I wanted to bake something this evening. However, I cannot decide what to bake. Flipping through my baking books, I was indecisive. Since I just bought a new silicone car mould, I wanted to bake cupcakes. Then, I cannot decide which recipe to use. To frost or not to frost. 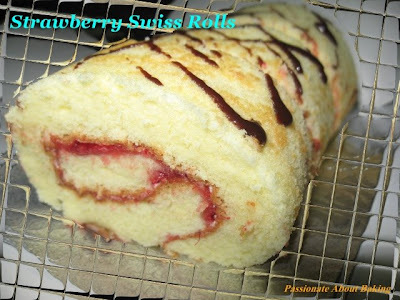 I wanted to bake swiss rolls, but I don't know what fillings I should make. I'm so INDECISIVE!! Finally, I settle on Alex Goh's Creative Cakes. The cake was meant to be cut out to be a smaller cake from the cake sheet. 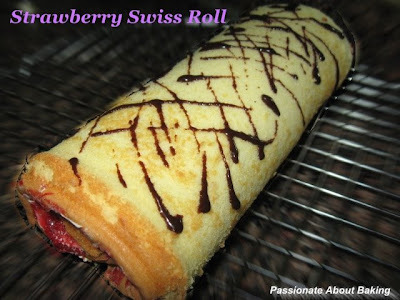 In the end, I use it to make swiss rolls instead. I made a strawberry swiss roll and a chocolate one. The chocolate turned out to be quite small. Recipe extracted from "Creative Making of Cakes". 4. Pour it into 2 12" square shallow mould. (I use a 13" x 17" sheet pan with some leftovers which I baked on my silicon car mould). 5. Bake at 190C on the middle rack for 20 minutes. (With my sheet pan, I baked for 12minutes only). 7. Frost it according to your preference. have you use a silicone mould before? if you need advice, let me know. :) i loved silicone ware coz its so easy to clean. Thanks. You're a fan of silicone bakewares too? I bought this silicone bakeware, but didn't grease it as I didn't think it was required, turn out, my "cars" were distorted, as if they all had came out from a chain accident. Can you share with me how to use them and clean them please? Thanks! I sell silicone bakeware mah..so have to know what it is, how it works. I used it for bake chiffon cake. comes out perfectly shaped. the inside of the silicone should be glossy finish. so when the cake is baked, leave it to cool slightly and pop it out. to wash it, just add liquid detergent to each 'hole' of your cars tray, pour boiling hot water over it. Leave it for 5 mins..then rinse with tap water, wash till soap is gone. hang up like wet clothes to dry! but the thing is, the ones sold at PM are not very good. I bought a mini castle(*6 in a tray) and all my cakes come out 'accident' like yours! since then, I never buy from them. It seems that the quality not so good.